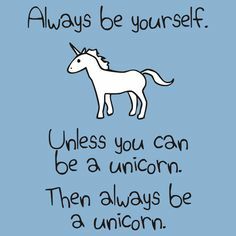 Academic job hunting: Unicorn status – Shawna Malvini Redden, Ph.D.
Last year, I felt like I’d just won the lottery. (If the lottery involved seven years of graduate study and three cycles of churning out 100+ page job applications by the dozen.) This year, I feel like a magical unicorn. My experience on the academic job market is not unique. Despite being well qualified for a new graduate—with publications, grant experience, and a strong teaching record—it took two years and three turns “on the market” to land my first tenure-track job. I remember sitting on the bathroom floor over Memorial Day weekend during my first turn on the market, in the middle of a complete meltdown after the last of the “Dear Sir or Madam, I regret to inform you” letters arrived six, eight, nine months after I’d applied for a particular job. Obviously by then I knew I wasn’t a candidate, but as the last glimmer of hope faded, I faced an undefinable time as a contingent worker. Then I laughed. It feels pretty damn personal when you spell out your life’s work, professional convictions, accomplishments, and abilities in 100+ pages (I am not even a little bit exaggerating) only to have them completely ignored or utterly rejected. Over and over and over. Of course the logical part of me knows there are a thousand things that go into hiring, especially in the context of academia where job offers can be a lot like marriage proposals, but man. My soul took a major beating. I felt like a disappointment. Bitterness suffused me with every rejection and it was even hard to be around dear friends who fared better on the market. I wished them well, obviously, but part of me also hated them a little bit, too. I started to recover last year as I worked at Chico State, my closest colleague and friend another person who understood the demoralizing nature of academic job hunting. I felt so lucky, surprised, and relieved to have a full time job, even if it was 100 miles from my home. So when an opportunity came up at Sacramento State, I hesitated, abeitly briefly. A school I dearly loved, IN MY HOME TOWN, but applying would mean a fourth turn on the gauntlet. The details and anxiety do not bear describing but miraculously, it turned out all right for me in the end (even if I feel a little like Katniss Everdeen). Fast forward to earlier this week. I’m sitting in new faculty orientation (for the second year in a row, so fun! ), marveling. My new colleagues are discussing recent moves, and I chime in with hopefully helpful info about Sacramento and the campus. Because I’m local and have taught here before. 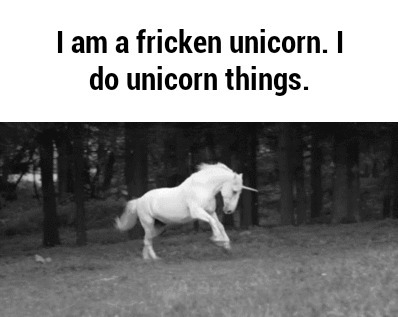 See the non-family friendly version and gif of doing unicorn things here. A couple days of orienting later, it hits me. I’ve hit academic magical unicorn status. A fantastic job, where I actually live, at a place where I used to work part time. Wild. I still feel some of the same surprise and relief as last year, but it’s layered with extra awe, gratitude, and excitement. Cannot wait for school to start!